With more than 60 million users across the globe, and over 4 million UK singles currently signed up, eharmony can practically guarantee you your happily ever after. This is not just because of the sheer amount of users, but also because of their specially developed relationship questionnaire, which promises to accurately find your match based on its 29 Dimensions of Compatibility. This unique personality profile matches people on the basis of factors such as character, age, energy levels, intellect, denomination, and family values. The eharmony site also offers advice and relationship tips with daily blogs, articles for those looking for love as well as couples who are already feeling loved up. Other sites may get you dates, but only eharmony promises harmonious love. 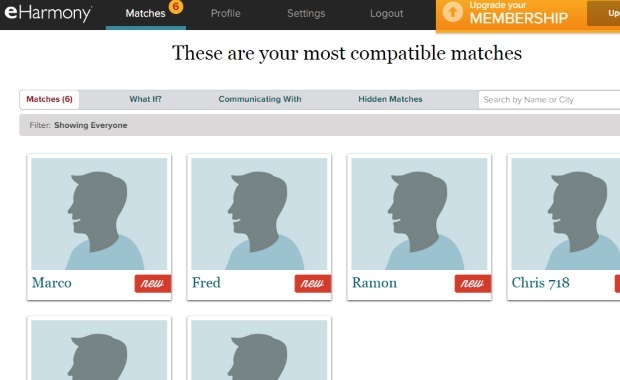 Although, eharmony does not offer gay and lesbian dating on their main site, it has launched CompatiblePartners, a site specifically dedicated to the LGBT community. While the name is different, the concept is the same. By using eharmony's personality questionnaire and algorithm, CompatiblePartners aims to match LGBT singles with other singles based on their personality. Questions come in a few types, most taking only seconds to answer, and some needing a little more thought. Choose from preset options to declare your education, employment, religion and physical attributes, and then go on from there to some more probing questions. These are innovatively designed to uncover features of your personality, and involve you ranking yourself by descriptions or adjectives on a scale. The initial signup allows users to specify what they are looking for in a match so that 50+ daters, Christian singles and all types of people can find exactly what they are looking for. After this, you will be able to describe what you are looking for in a match, such as interests, denomination, and age. This section also includes deal breakers and expectations in both physical appearance and lifestyle choices. eharmony takes over from this point. You will receive daily matches directly to your email inbox as well as on the messages section of the website, which is easy to navigate. The website itself is minimal, as there are no profiles to search through yourself other than your matches. This makes it an excellent choice for anyone less tech savvy, as well as those more experienced. Helpful tips and tricks are shown often at the start to help find your feet with the various toolbars and options, so that you don’t miss out on any functionality. Simply sit back, and start communicating with your matches, all of whom are pre-verified for compatibility. If you’re nervous about reaching out, guided communication helps you ease into your chat, with ice breakers, pre-set questions before eharmony mail or Secure Call. The eharmony website is a fun place to be, with new articles and blog content on relationships and dating being uploaded every day, always giving you something to think about or easily discuss with your matches. An amazing addition to their site is the eharmony mobile app, which is available on Android, iOS and Windows, too. It lets you easily browse your matches, communicate on-the-go, upload photos directly from your image gallery and receive real-time notifications when you get a match or a new message. With such an investment in getting to know you and what you’re looking for in a mate, you can expect to pay a little more at the outset. As a premium matchmaking service, the eharmony prices are higher than some other dating websites we’ve tried, but we believe this is for a good reason, and they are well worth the initial outlay. As with many websites, the longer you sign up for the cheaper your subscription will be. Sign up for 2 years of membership, and your monthly cost can be as little as £7.95. 12 months may seem more manageable a time period to you, which is still a bargain for £9.95 per month, and saves you over 70% from the full price membership. Choose to commit for 6 months, and this will cost you £18.95 per month. If you want a shorter term subscription, you can choose 3 or even 1 month, which is £21.95 per month or £44.95 respectively. Subscribing from the mobile app starts at £14.99 per month. The Total Connect plan costs an average of a few pounds extra and allows you access to Safe Call and a more in-depth personality profile. eharmony may in fact be one of the safest online dating sites, making it a popular choice among 50+ daters and young daters alike. Usres do not approach profiles themselves, and can enjoy having matches from pre-vetted profiles presented to you, without fear of scams or malicious intent. In fact, the website itself is not really set up for anyone who is not serious, as a result of the lengthy sign up process! Only members can see photos, and you’re your matches can view you and your profile. However, you will still find a dedicated safety tips page which allows you to read up on keeping yourself safe both on and offline. eharmony and CompatiblePartners, eharmony's dating site dedicated to the LGBT community, are serious about commitment minded relationships, and offers unique scientific personality profiling to get you there. The beautiful and insightful Book of You was enough to catch our interest. The gorgeously designed profiles and sleek design both on desktop and mobile make the website a pleasure to use. Along with 4 million other UK singles…we’re hooked!